In energy, there is one end game: transition our planet away from fossil fuels to a resilient, renewable energy system that reliably provides energy with little to no impact to the environment. No matter how heated the debate becomes, we must all remember that we all want the same end result. However, how we get there is an entirely different matter, and there are a number of competing ideologies, offering starkly different pathways, that must be examined and weighed before society dedicates its full range of resources to the problem. One such ongoing debate concerns whether to balance intermittent renewable energy through a multi-state, regional transmission grid, or to focus on developing a network of local energy microgrid systems located closer to end use. While these technologies can co-exist at one level, and there is no scenario where the opposite path isn’t present to some degree, there just aren’t enough resources to develop both pathways to their full potential. A decision must be made and a path followed. We believe the correct path is towards distributed energy, managed in the form of interconnected microgrids, with planned excess energy stored seasonally in a tiered hierarchy of storage media. Who has to pay for that infrastructure? I’m fine with building it if the risk lies with the projects generating and distributing all that “cheap” wind power from Wyoming and Texas. Again, wind and solar may be cheap at the point of origin, but the costs increase the farther out the end-use location. Who should bear the risk? I say let the outlying states pay for cost of transmission and pass it along to the end user, instead of spreading it among all consumers, whether they want it or not. That would be the most honest way of accounting for the true cost of all this “cheap” energy. Also, If I were a terrorist, what would be an easier target? A microgrid (one location) or one of a series of high-voltage DC towers that could bring down a multi-state power grid? A no-brainer in my book. Conversely, in a distributed energy network, distance is kept to an absolute minimum and the cost of transmitting over distances is incorporated into the cost of energy imported through the power grid. Transmitted energy is transactional, not part of daily operation of a community microgrid. Intermittency is resolved through varying levels of energy storage, ranging from milliseconds for frequency regulation to extended-duration storage medium such as hydrogen to cover exceptional periods of low production ranging from days to weeks and even months. Thousands of terawatts of solar energy are absorbed by this planet every day, and every state has the potential to collect enough renewable energy for both immediate use and storage of excess capacity for later use as needed. The only limiting factor is the infrastructure to collect and store that energy. In this situation, excess energy must be converted to seasonal storage reserves in order to ensure reliable, on-demand energy access for both the grid and transportation sectors. 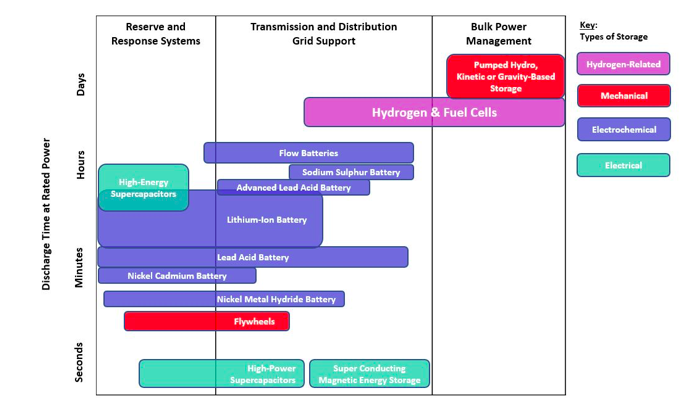 In our renewable distributed system, excess energy is converted into various storage mediums, the last of which is of an extremely extended duration (weeks/months years): pumped-hydro, hydrogen, gravity systems (ex: ARES), compression systems (ex: CAES), and high-capacity flow battery systems (see graph below). Modified from Energy Storage Technologies Explained, EnergyStorageSense.com. Furthermore, in a 100% renewable system, energy is harvested, not generated. 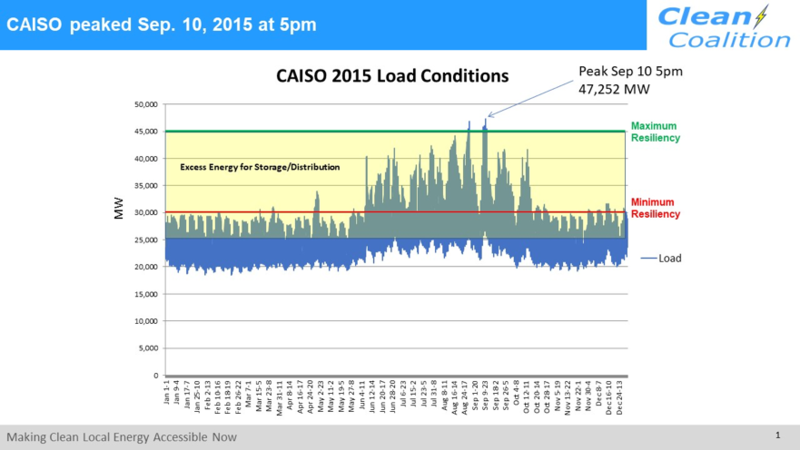 Critical microgrid systems built to target maximum load conditions can harvest, distribute or store energy during lower peak months (see graph below). Conversely, what happens after this incredibly expensive HVDC transmission grid is finally built, only to find that there is no regional market because every state is collecting and storing surplus energy? If Texas and Wyoming really want to leverage their renewable resources, they will transition from extracting oil and natural gas to manufacturing electrolyzed hydrogen, stored in strategic reserves (as is done now with oil and gas) as hydrogen (H2), synthetic methane (CH3) or ammonia (NH4). In a fluctuating, intermittent energy system, these extended-duration storage resources will carry a premium price as the glue that ensures system reliability and resiliency. To fully transition to renewable energy, trillions of dollars are going to be spent over the coming decades, but those in favor of balancing through regional transmission systems believe a significant amount should be spent on HVDC infrastructure, where costs are socialized through rate-basing, while profits go to those investing in all that “cheap” energy. Sorry, but I just don’t see the logic in moving huge volumes of energy over hundreds of miles each and every day, when the same volume can be harvested and stored at or near the point of end use. In a nutshell, the issue comes down to the fact that (i) grid regionalization is a “solution in search of a problem,” as there is already an existing grid for energy transfers across state lines, (ii) regionalization measures such as AB 813 would erode California’s energy autonomy by creating a market controlled by FERC and states who do not share California’s vision and values and (iii) the pursuit of a regional HVDC grid will divert precious resources from California’s stated goal of developing a distributed energy network of microgrid systems. In short, the most effective strategy towards achieving California’s ambitious emission reduction goals is to create and use energy locally vs. constructing a massive, multi-regional, high-voltage DC grid, paid for indiscriminately by ratepayers, that transfers hundreds of gigawatts across state lines every day via transmission lines that are vulnerable to environmental disruption and terrorist attacks. To recap, the end game remains the same: we all want to survive the climate changes that will be occurring over the coming decades and centuries. We have different ideas on how to get there, but the real truth is that we will need both distributed and transmitted energy to replace existing fossil fuel capacity and reach a 100% renewable energy economy for both the power grid and transportation sectors. The only question is what type of system do we start down the path? The advantage of distributed energy is that it is highly modular and can be implemented incrementally over time. An HVDC transmission is a massive, nation-wide infrastructure project that will likely take at least one decade to build and will likely become superfluous when other states fully develop their own renewable infrastructure and no longer require constant transmission of large volumes of energy over state lines. Better to start building microgrids now, and strategically develop a multi-state transmission system that can deliver energy on a transactional basis. Post-Script: For those interested in learning more about this incredibly important issue, I invite you to read “Exploding transmission costs are the missing story in California’s regionalization debate,” a detailed and informative op-ed contribution by Doug Karpa, Policy Director at Clean Coalition. I also urge everyone to view the recent debate between former CPUC President Loretta Lynch and former FERC President Jon Wellinghoff regarding grid regionalization and AB 813, a state bill currently under consideration that would seriously impair California’s influence and autonomy in implementing renewable energy policy.